At least one spot in the 2019 Kentucky Derby will be solidified Sunday in the Grade 3, $800,000 Sunland Derby, which features a matchup between California shippers Mucho Gusto from the Bob Baffert barn and Blaine Wright-trained Anothertwistafate, who has done his best running — so far — on synthetic. The Sunland Derby awards Derby qualifying points on a 50-20-10-5 scale. The winner certainly is on to Churchill Downs, while runner-up points would position Mucho Gusto, who enters with 14 points, on the bubble. With post time 7:30 p.m. ET, TVG will feature live coverage, or you can live stream the race through advanced deposit wagering services such as NYRABets. It’s free to sign up! Learn more about Sunland Park Derby contender ANOTHERTWISTAFATE with his Trainer Blaine Wright & Jockey @JJHernandezS19! Robert B. Lewis (G3) winner Mucho Gusto will face off against runaway El Camino Real Derby hero Anothertwistafate in Sunday’s $800,000 Sunland Derby (Grade 3) – the premiere race at the Hobbs, N.M., track’s Thoroughbred meeting. Mucho Gusto defeated four rivals by 4 ¾ lengths in the Robert B. Lewis at Santa Anita. 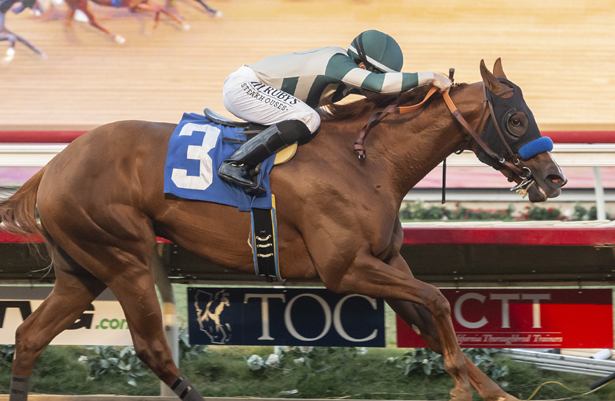 The son of Mucho Macho Man only has one blemish on his four-race resume – a runner-up effort behind top Kentucky Derby contender Improbable in the Los Alamitos Futurity (GI). Anothertwistafate will make only his second career try on the dirt following three runaway scores at Golden Gate Fields in northern California. He finished ninth at Santa Anita on debut but has since gone 3-for-3 at Golden Gate Fields. Other top challengers include local stakes winner Hustle Up, a New Mexico trained by Todd Fincher, who won this race a year ago with Runaway Ghost; Steve Asmussen-trained Wicked Indeed, second to Hustle Up in the local Mine That Bird Derby; and Cutting Humor, the former Southwest Stakes (G3) favorite who ships in for Todd Pletcher. Two races earlier on the card, Chasing Yesterday, the Grade 1-winning sibling of American Pharoah, headlines the Sunland Oaks, a Kentucky Oaks prep.